52. In the last 15 years, countries in the Danube region have been part of a trend toward greater independent regulation of water and wastewater service provision, especially in counties with larger or regional utilities. Of the 16 countries included in this report, 9 have an independent regulatory authority that oversees the water services sector: Albania, Bulgaria, Croatia, Hungary, Kosovo, Moldova, Romania, Slovakia, and Ukraine. Of these regulatory agencies, only the Albanian Water Regulatory Authority started operating before 2000. 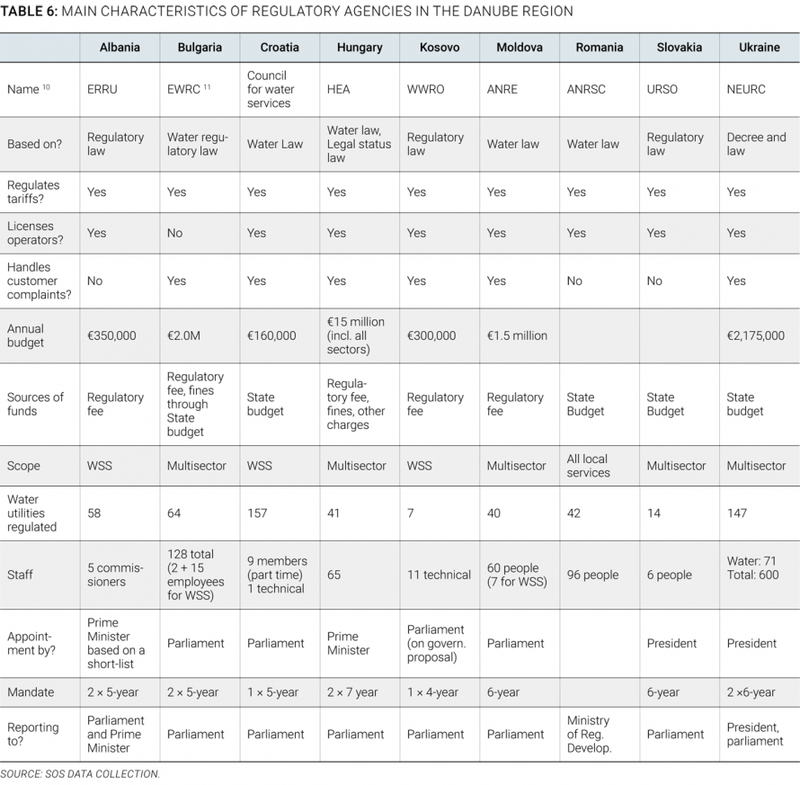 Others were established or assumed regulatory functions over water services in the last 15 years (Figure 21), often in parallel with or as a prerequisite to a utility sector restructuring or regionalization effort (Croatia, Kosovo, Romania). In addition, there are ongoing discussions and studies being conducted to evaluate the possible formalization of regulatory frameworks in three additional countries (Bosnia and Herzegovina, FYR Macedonia, and Montenegro). 53. Of the nine independent regulatory authorities in the region, only three are water-sector specific: Albania, Croatia, and Kosovo. The remaining six authorities are multisector, also regulating the electricity, district heating, and gas sectors, among others. One of the arguments in favor of a multisector regulator instead of a dedicated one is to allow the transfer of regulatory knowledge and expertise from one sector to another. Furthermore, a multisector model, at least theoretically, would increase independence of the regulator by not allowing a single sector to dominate the agenda and make the agency financially dependent on any sector or large utility. Yet, this may not be the case in practice. In a regulatory workshop organized by the Danube Water Program, two multisector regulators said that the water sector often takes a lesser regulatory priority than the electricity sector in their agencies, sometimes resulting in postponed decision making when it comes to the water sector. 54. All regulatory authorities in the region play a formal role in tariff setting and approval, often alongside local government authorities. Of all regulators, only the Hungarian one has an advisory role in the tariff-setting process (the formal decision rests with the line ministry). The remaining regulators have a direct responsibility for determining tariffs, either by formally setting them or by reviewing and clearing proposed tariffs, often after they have been previously approved by local government councils. In countries that have no dedicated economic regulator, regulatory functions such as tariff setting and service quality monitoring are generally performed by local governments, sometimes with the involvement of a national government control mechanism (FYR Macedonia, Serbia). 55. Tariff-setting methodologies vary across countries, but a revenue cap is most widely used. Four countries in the region—FYR Macedonia, Kosovo, Romania, and Ukraine—use the rate-of-return approach. Hungary, Montenegro, and Serbia do not have a developed methodology for determining tariffs in place. In practice, however, since utility companies in the region are largely owned by local governments, which largely prioritize lower tariffs rather than higher profits, tariff setting is not as effective a regulatory instrument as it would be in a private, profit-driven context. 56. Regulatory agencies in the region vary widely in their independence, governance, and financial and human resources. Although all agencies are nominally independent, in about half of the cases they depend on the state budget for their operation, and their management is appointed by the executive branch, as opposed to the parliament. Furthermore, overall staffing and budget vary significantly, although some trends can be observed. 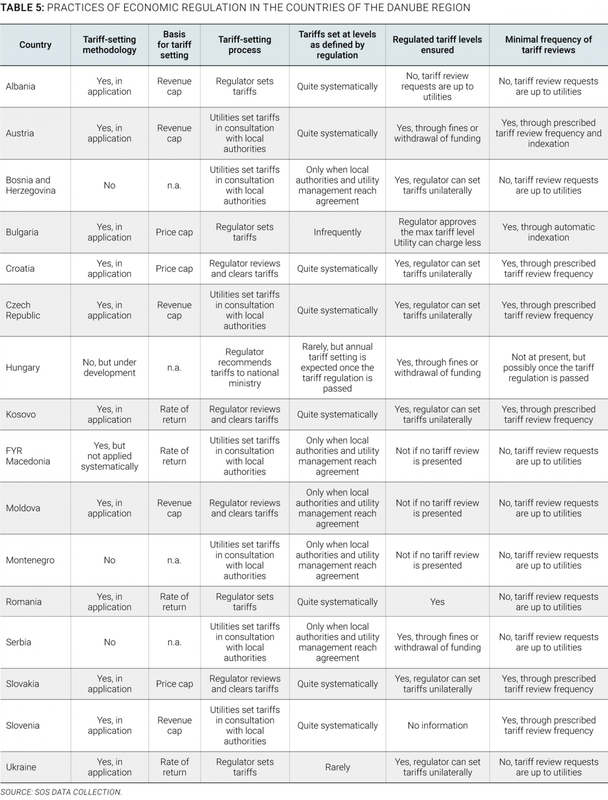 Regulatory agencies that regulate mostly municipal utilities tend to have a ratio of around one staff for each three to four utilities regulated, while agencies that regulate large regional operators (Hungary, Kosovo, Romania) tend to have around two staff for each utility; Croatia, where the regulatory framework is still incipient, is an exception, with only one technical staff for the whole country (Table 6). 57. Service quality regulation is normally the responsibility of a public health ministry or agency, while environmental regulation is the responsibility of an environmental ministry or agency in each country. None of the countries in the region have concentrated all regulatory activities under a single agency; in fact, in a number of cases the regulatory agencies have been established on top of existing structures, leading to complementary or sometimes conflicting roles vis-à-vis local governments and line ministries.